The foreshore of Cape Town, now a smart business precinct with glass-clad buildings and coffee shops, was a much seedier address in the 1960s. Sailors and prostitutes mingled in what essentially was the city’s red light district. It was here where Billy Monk worked as a bouncer at dockside nightclubs like the Catacombs. As the name suggests, the club was underground, dark and dingy with black, scuffed walls. Sequestered from the apartheid-lead world above ground, the Catacombs was where the Immorality Act was defied and revellers from all subcultures partied; high society debutantes, prostitutes, transgenders, crooks, sugar daddies, mixed-race couples and Japanese sailors. Monk bought a 35 mm Pentax camera from one of those sailors and began snapping candid portraits of the club patrons. He was a better photographer than bouncer and began earning money on the side by selling the photos to his subjects, who after seeing him weekend after weekend, became his friends (and in some cases, lovers). Maybe this is the reason he managed to capture images of such freedom and lack of inhibition. A decade later, with his Pentax long since packed away, his archive of photographs was rediscovered in his old studio by Jac de Villiers. He was immediately drawn to the images and with Monk’s permission, curated a critically acclaimed exhibition held at the Market Gallery in Johannesburg in 1982. Billy Monk never got to see this exhibition. On a pit-stop en route to Johannesburg from Port Nolloth (where he was diving for diamonds at the time), he was involved in an argument and was shot dead. His work lives on though, and continues to enthral and offer a rarely-seen documentary of the underbelly of Cape Town in the 1960s. An honest and compassionate portrayal of life through his viewfinder, beyond the protests and struggle for liberation and the imagery we usually see from this period. His photographs have permanent homes in the South African National Gallery and the San Francisco MOMA and now, exactly fifty years since they were taken, a new selection will be unveiled at the Investec Cape Town Art Fair. A Clean Heart and a Cheerful Spirit – a nod to the tongue-in-cheek interpretation of Psalm 51’s Redemptive Prayer, painted across the walls of the grubby club – provides a fitting title to this showcase of 25 never-before-seen images. 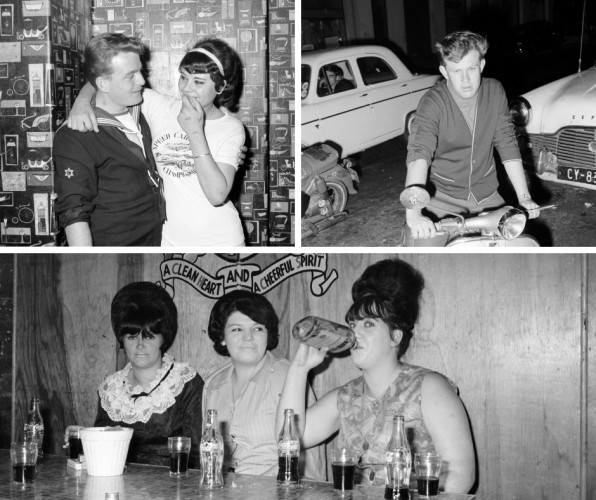 Billy Monk’s photographs evocatively capture an era. They depict not only the hems and waistlines and the beehives and coifs, but the decadence of a cross-section of society in apartheid South Africa comprising world-weary people who just wanted a place to escape – to drink and dance on tables and pass out.